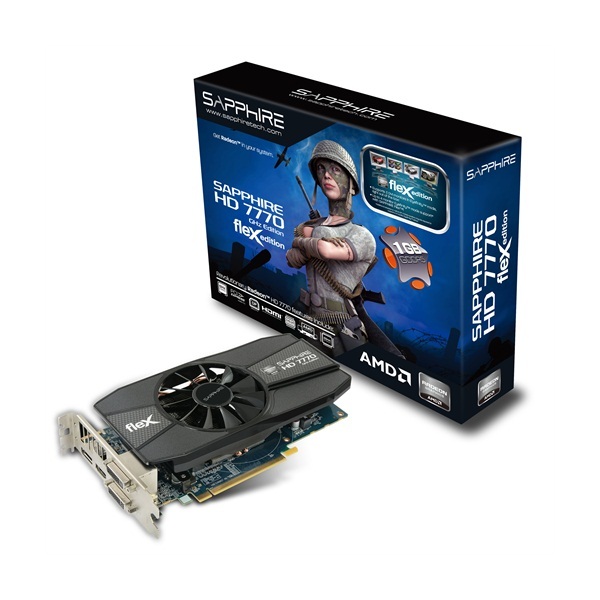 Following our recent reviews of the Sapphire HD 7950 FleX Edition and Sapphire HD 7870 FleX Edition, we are taking a look at Sapphire Technologies HD 7770 FleX Edition video card. This particular model is the lowest entry point for those of you looking for a 7000 series FleX Edition video card. If you’re unfamiliar with Sapphire’s FleX technology, it’s essentially an enhancement to AMD’s Eyefinity multi-display technology that simplifies the equation for anyone looking for a three monitor setup, by removing the DisplayPort requirement. This allows you to leverage monitors that support more common HDMI/DVI/VGA connectors, which translates into more cost-attractive options (as monitors with DisplayPort support are limited and generally more expensive). Sapphire’s FleX technology has been very well received and we were very impressed with the other HD 7000 Series FleX Edition cards we reviewed, so we’re hoping for a repeat performance with the HD 7770 FleX Edition.